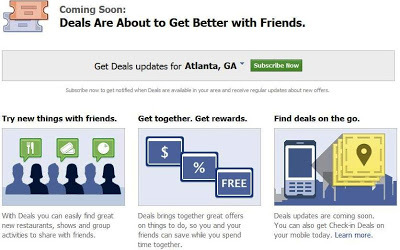 Facebook is now entering the local deals business, much like how Groupon.com works. In November 2010, social media titan Facebook announced “Facebook Deals”. That has evolved over the past few months and in recent announcements, they have begun advertising just what exactly they intend to do. The fundamentals behind this new initiative are that local businesses send Facebook coupons for groups to participate in. This can include, for example, “25% off your dinner for parties of 6 or more”. This new addition is making Groupon.com a bit nervous as Facebook aims to accomplish exactly what Groupon did that rapidly brought them to fame. They’ve added a tab titled “Deals”, which briefly describes the idea, and where the service is available as of right now. Currently, it is only available in Atlanta, Austin, Dallas, San Diego and San Francisco. Facebook has not clearly stated when it becomes available in other major U.S. cities, only “coming soon”. It seems as though news breaks every day that confirms the statements of Kenneth C. Wisnefski, Founder and CEO of WebiMax that “social media is emerging as the new era of marketing, beginning to replace traditional marketing tactics”. Companies that haven’t contacted an SEO company that also specializes in Social Media Campaigns perhaps should. “Much of WebiMax's success is a result of our ability to continuously evaluate the internet marketing industry (since it is constantly changing and evolving) and find ways to adapt and stay ‘one step ahead’ of the curve' ”, says Wisnefski. Businesses may be asking themselves “How can Facebook Deals help me”? “This helps businesses in 2 ways. Customer loyalty and social distribution:"
"This builds Customer Loyalty because users who check-in to a place more than a specified number of times can get a reward incentive. Social Distribution is built since as customers check-in and redeem deals, stories are published to their profile about that deal. The result is that their friends will see when they redeem deals and in turn help spread awareness about any promotions businesses are running". Now more than ever is more reason to consider having the #1 rated SEO company by TopSeos.com build an effective social media campaign for your company.